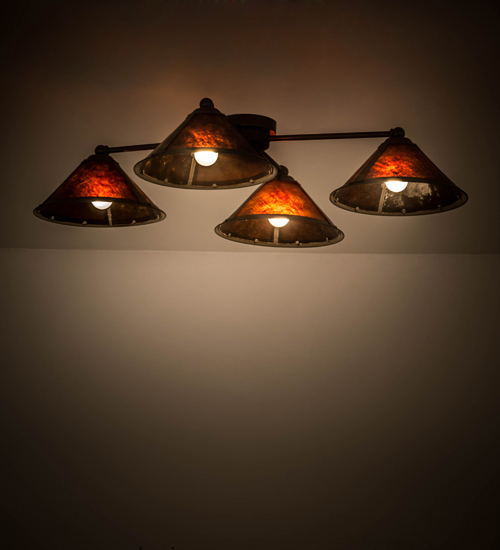 Description: In the tradition of American master craftsman Dirk Van Erp, four appealing hand finished Timeless Bronze shade frames glow with beautiful ambient light diffused through stunning Silver Mica. The shades are complemented with matching hardware and ceiling canopy. This handsome fixture was created by the hands of Meyda Craftsman at its manufacturing facility in Upstate New York in the USA. Custom sizes, styles and colors are available, as well as dimmable, energy efficient lamping options such as LED. The fixture is UL and cUL listed for damp and dry locations.